UPDATED: December 20, 2012 / 8:02 p.m.
Inez Andrews, long time member of the Chicago-based Caravans, passed away after a long illness at the age of 83. Cancer is stated to be the cause of death, according to her granddaughter Vanessa Moultry. Andrews, born on April 14, 1929 in Birmingham, Ala, was most legendary for her powerful contralto and for singing gospel classics such as the 1972 crossover gospel hit “Lord Don’t Move The Mountain,” “I’m Not Tired Yet” and the popular favorite “Mary, Don’t You Weep,” which was re-recorded famously by Aretha Franklin on her best-selling Amazing Grace album in 1972. 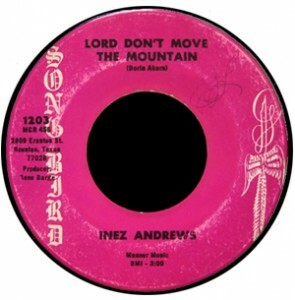 “Lord, Don’t Move the Mountain” (sometimes known as “Lord, Don’t Move That Mountain”) was considered anomalous for the world of traditional gospel music in the early Seventies. Although crossover hits had been favorably known during the “race record days,” before gospel’s luxurious Golden Era in the ’50’s and ’60’s, it was still very rare to see a gutsy gospel tune regulated to the B-side of “I’m Free” turn into a radio favorite. Suddenly, radio glued to R&B and the traditional blues found themselves turned on by the fervor of Andrews’s soul. Recorded on the Peacock subsidiary Song Bird, the Doris Akers-penned, Gene Barge-produced tune was picked up by MCA as its main distributor. The song climbed to number 48 on Billboard’s R&B single chart. After leaving the Caravans to pursue a solo career, Andrews enjoyed a great deal of success recording with several music labels including Jewel, Songbird and Savoy Records. She managed to record “Just for Me,” a tune that expanded her popularity well into the Eighties. Her last album as a solo artist was recorded in 1991 where she united with the Thompson Community Singers for Raise Up a Nation on Epic Records. Among her last great accomplishments, Andrews reunited with living members of the Caravans to record the Grammy-nominated Paved the Way, an album that also featured the crowned Queen of Gospel Albertina Walker before she passed almost four years later. Andrews passed away at her home in Chicago, Illinois located on Chicago’s West Side, where she lived since leaving Birmingham to record with the Caravans. Andrews is survived by daughters Legretta, Gail and Sue, and sons Wendell Jr., Mark and Casey. Her son Richard Gibbs played piano for a host of gospel artists including Rev. Milton Brunson and Mavis Staples and is currently on tour with Aretha Franklin. She is also survived by 19 grandchildren and 12 great grandchildren. It was stated above that she is the last of the Caravan, what about Shirley Caesar? The article never stated that.